When checking in to a suite at a swanky five-star hotel, there are the standard things you’d first look out for: The view, the bed, and the bathroom. The latter is particularly important, considering that it’s where you spend most of your time awake. Getting ready for the day, putting on your makeup, and mirror selfies are all daily rituals held in the bathroom. It is a private enclave where you can let your hair down (literally) and be yourself in a space that’s already your own. Sure, we all have our own bathrooms at home, and we might do the same aforementioned activities in it as well. Yet somehow, we find ourselves lusting over the look of bathrooms in hotels more than we do for our own at home, simply because the former feels so much more elegant and posh. But it doesn’t always have to be that way. With Axor and Hansgrohe, the option to outfit your bathroom with luxurious furnishings is now more than possible. 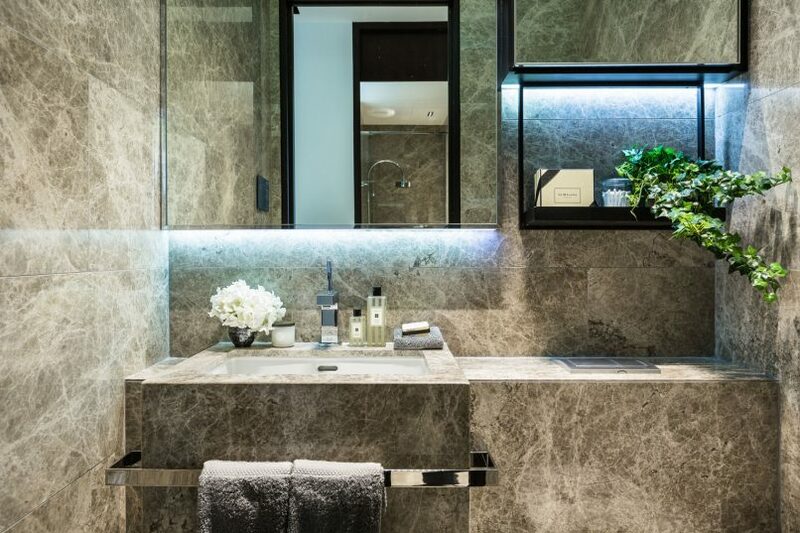 Read on for our tips on to how to get that swanky hotel bathroom look in your own home. Before you set about shopping for furnishings, make sure you have a theme in mind. There’s no point throwing a blend of fancy taps and stylish soap dispensers into the mix just because they seem trendy. The key to nailing the look of a luxe hotel bathroom is consistency. Be it industrial, classical, or modernist, the theme you give your bathroom should be versatile enough to fit into the overall interior design of your home. 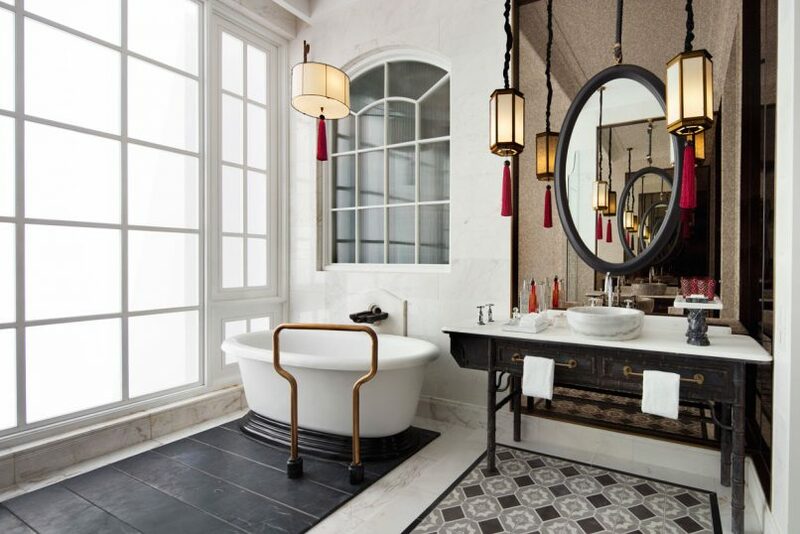 One of the beautifully appointed bathrooms at The Warehouse Hotel, located on the bank of Robertson Quay. An example of an industrial-themed bathroom would be at The Warehouse Hotel along Robertson Quay. 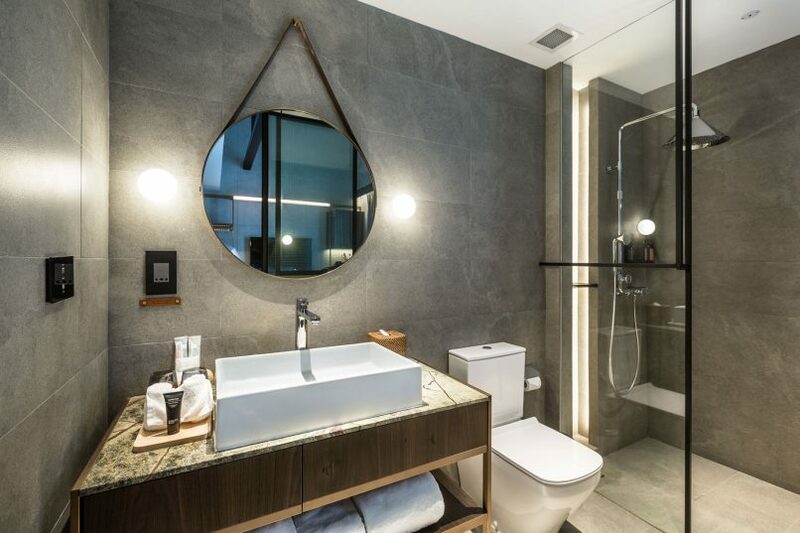 The bathrooms in all its 37 rooms have been fitted with award-winning Axor shower products that were conceptualised by Swedish design studio Front. Think exposed pipes and valves that truly bring out the industrial element. Next up is the lighting you want to have in your bathroom. While you’d want to be able to see the finer details when putting on makeup or shaving your face, you wouldn’t want to be subject to harsh lights — especially if you get soap in your eye. The trick is to use different lights for each individual space in the bathroom. 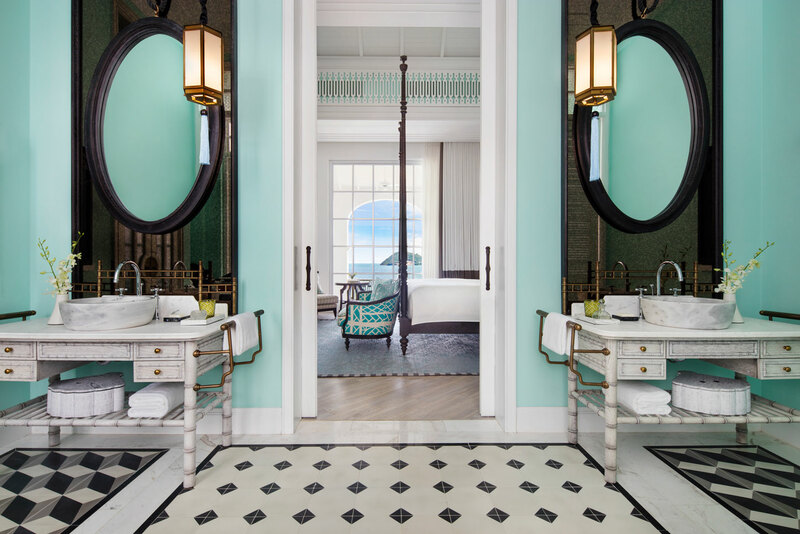 One of the classically designed bathrooms at the JW Marriott Phu Quoc Emerald Bay Resort and Spa in Vietnam that has an abundance of natural light streaming in from the windows. Your vanity area should have lights that are angled to reduce the shadows on your face, like strip lights placed on the top or the sides of your mirror. For the shower, make sure the lights are waterproof, as they will be constantly exposed to moisture. But nothing will beat a healthy dose of natural daylight that streams into your bathroom. It’ll set your day right when you wake up, and your selfies taken will be on point. Be it marbled tiles, non-slip wood, or mosaic patterns, textures are important to get that swanky look right. It adds an extra dimension to your bathroom and is a great way to show off your taste. You don’t need to cover the entire space in a single tile or pattern. Feel free to switch things up with various colours and even with 3D styles behind your bathtub, shower or basin. The Martin Modern condominiums, while not exactly a hotel, are what textured bathroom dreams are made of. The elegant Axor Citterio bathroom fittings seal the deal. Marbled tiles are also another way to provide the ultimate luxe treatment for your bathroom. If you’re after a more serene and calming environment, teak wood or stone will be your best bet, as they bring in a bit of the natural world into your little space so you won’t feel claustrophobic. Aside from our sight and touch, our sense of smell is a major factor to whether we’ll enjoy our daily bath time. And let’s be honest, sometimes the odour will get too overwhelming in a bathroom. Scents from candles and diffusers will help transform your ordinary bathroom into an at-home spa. Odour eliminators are the product you need to get, should you have any pre-existing issues in your bathroom. They ensure that those bad smells don’t even get to fester within your luxuriously-appointed bathroom. Candles, diffusers, and other scented items are also just as important to make sure that your bathroom is inviting and has a pleasant fragrance. A sign of a modern home is when even the bathroom fittings are equipped with the latest technology. This means intuitive and uncomplicated controls, which are a true luxury in an age where manufacturers are trying to one-up each other with unnecessary functions that nobody wants. 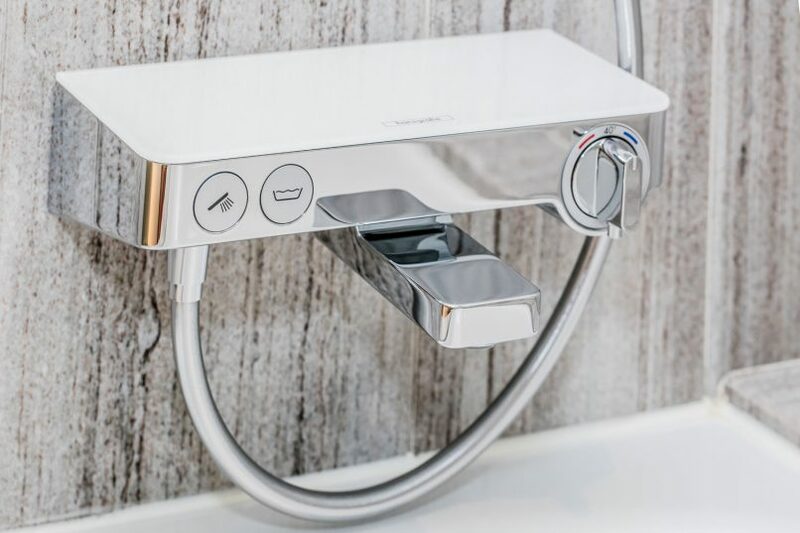 The Hansgrohe Select range of bathroom fittings is intuitive and easy to use. Hansgrohe’s Select range of bathroom furnishings lets you switch modes with a single tap. 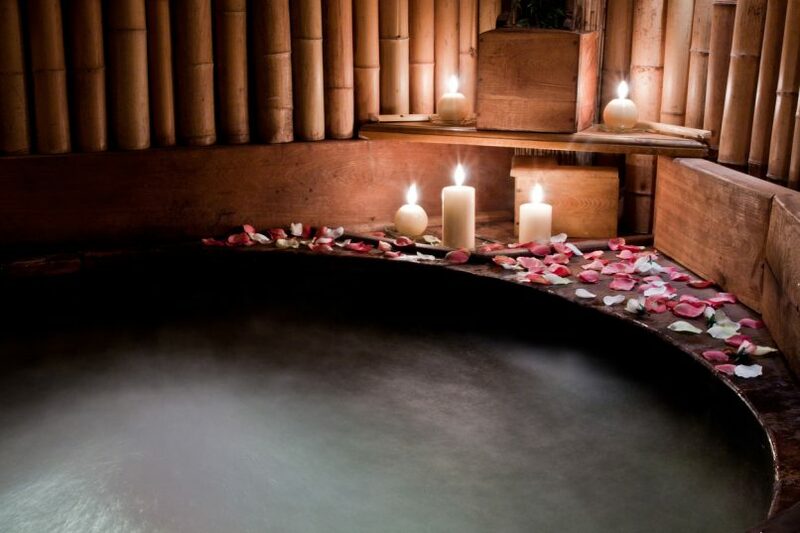 Want to bask in a rain shower, or fill up the tub with warm water? Just press the relevant button. The only knob you’d have to turn would be to adjust the water temperature, but even then the ranges are clearly indicated.